Do you have missing or severely damaged teeth? Restoring your smile could change your life! If you choose to get dental implants in San Antonio, you’ll get new teeth that are sturdy, beautiful, and easy to care for. Countless people have benefited from this aspect of dentistry. But what exactly should you expect during your journey? Here is a quick look at the dental implant process from beginning to end. The first thing you need to do is find out if you are a good candidate for dental implants. Your dentist in San Antonio will examine your mouth and ask you a few questions about your lifestyle and habits. If you have good oral and overall health, great oral hygiene habits, and a strong jawbone, you may be a good candidate. If your jawbone strong enough to support your new teeth, you might need a bone graft before you can receive implants. The material for the graft might come from the bone in another part of your body, or the surgeon may use artificial bone. After your surgery, your body will need some time to integrate the new bone into your jaw. If it is a very minor bone graft, it might happen at the same time as the implant surgery. During the implant surgery, little titanium posts will be inserted into your jaw. The posts are usually made of titanium, but other metals, such as zirconia, are sometimes used. Over a period of months, the implants will bond with your body through a process known as osseointegration. This creates an extremely sturdy base for your new smile since the implants act like natural tooth roots. 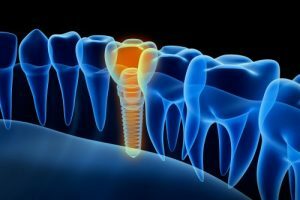 If your care provider deems that the implants are stable, they may place the abutments during the implant surgery. Abutments are little pieces that go on top of the metal posts; it is what your new tooth or teeth will get attached to. Once your body and implants are ready, your dentist will make molds of your teeth and jawbone, which will serve as the basis for creating your new pearly whites. After your custom-made chompers are ready, your dentist will attach them to the abutments. The dental implant process is different for everyone. For people who have a minimal risk of complications, it might be possible for Drs. Jones and Knight to perform the surgery right in their office. In other cases, they may have to refer the patient to a specialist. They want your journey to be as painless and smooth as possible, so feel free to talk about any questions or concerns you have. The more informed you are, the more confident you’ll be in your final decision of whether to receive implants or not. Dental implants in San Antonio could change your life! Why not talk to your dentist about them? Dr. Troy Jones and his associate Dr. George Knight have decades of experience in dentistry. They’re passionate about helping their patients to achieve healthy, functional smiles. If you have questions about implants, please contact our office.